Alastair Mackie, David Rickard, Oscar Santillan, Tom Dale, Yun-Kyung Jeong. 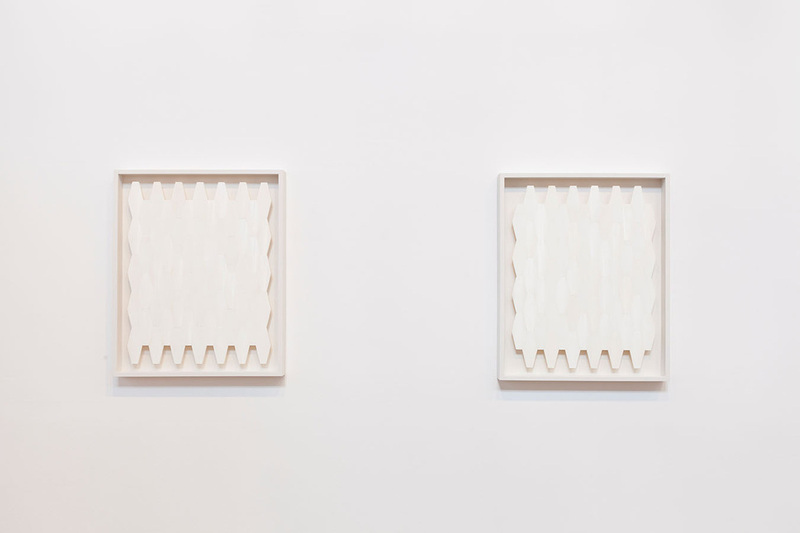 As the work of Alistair Mackie and Yun-Kyung Jeong reminds us, repetition can be found throughout nature. Borrowing motifs and materials from the natural world, these artists point to the rational systems of order which can be found in all organic life. However both impose a further human cultural order onto the natural through their artistic processes. Conversely Tom Dale, David Rickard and Oscar Santillan take man-made objects and images as a starting point, exploring mass production, advertising and media in terms of repetitive human behavior. 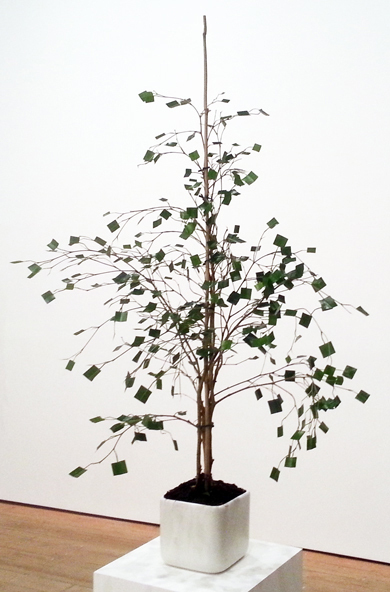 In Tom Dale's sculpture ‘The City at Night’ , a ‘ficus’ plant, commonly found in office foyers and receptions has had all its leaves cut into squares in an unseen performance This attempt to impose the rational and logic of the grid or the network upon a natural form highlights the neurotic and fanatical drives that have remained hidden in both early and late modernism. This is no brutalist work however, as the plant in-turn responds with a subtle performance of its own. Over the duration of the exhibition it uses the square leaves to sustain itself until it can quietly restore itself to its natural form, shedding the remains of the modifications around it. 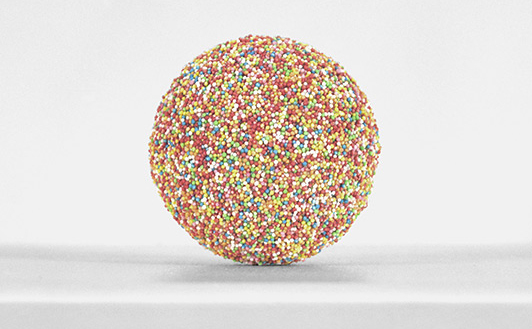 David Rickard produced One Hundred Thousand (2004-5) over the course of a year, in which he counted and joined exactly 100,000 ‘hundreds and thousands’ to form a small sphere. 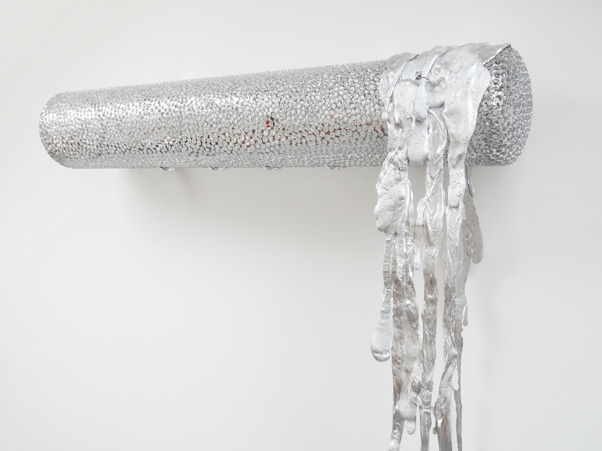 For Rickard, art and production are inherently and importantly linked; this work is presented as the evidence of a painstaking artistic process, whereby the process takes on more importance than the result. The work also functions on belief - since it is impossible to tell with the naked eye how many sweets are in the sphere we must trust the artist's statement. 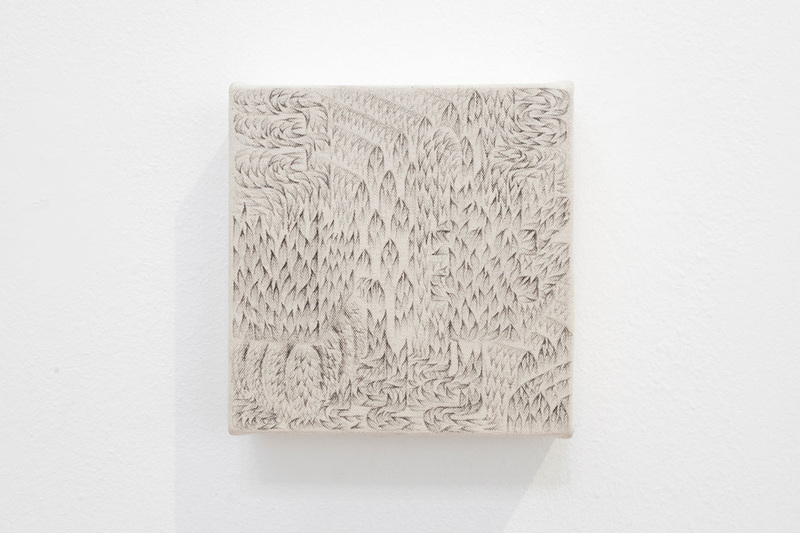 Yun-Kyung Jeong’s works are composed through the repetition of a small leaf-shaped motif. These motifs are combined and re-combined into shapes evocative of a range of conflicting forms derived from both nature and architecture. In Axonometric Jungle VI (2013) Jeong uses a repetitive process in order to exploit the constructive possibilities within the constraints of this one constant. The process is surprisingly organic; with pre-structuring kept to a minimum, the marks grow into form around construction lines that are intentionally retained to suggest an ever on going process. 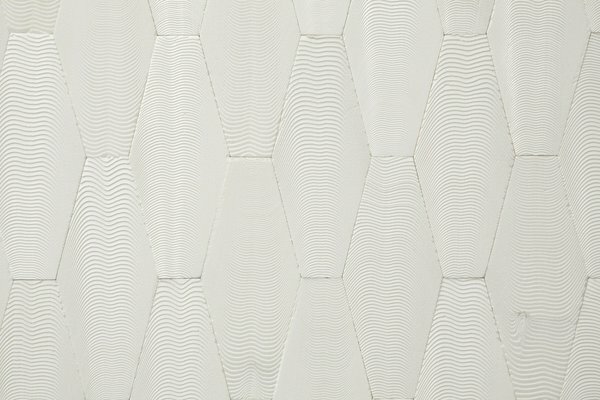 In order to create Complex System 58 and 59 Alastair Mackie collected and processed cuttlefish bones into geometric tiles, homogenising the irregularity of this natural material further by piecing the tiles into interlocking patterns. 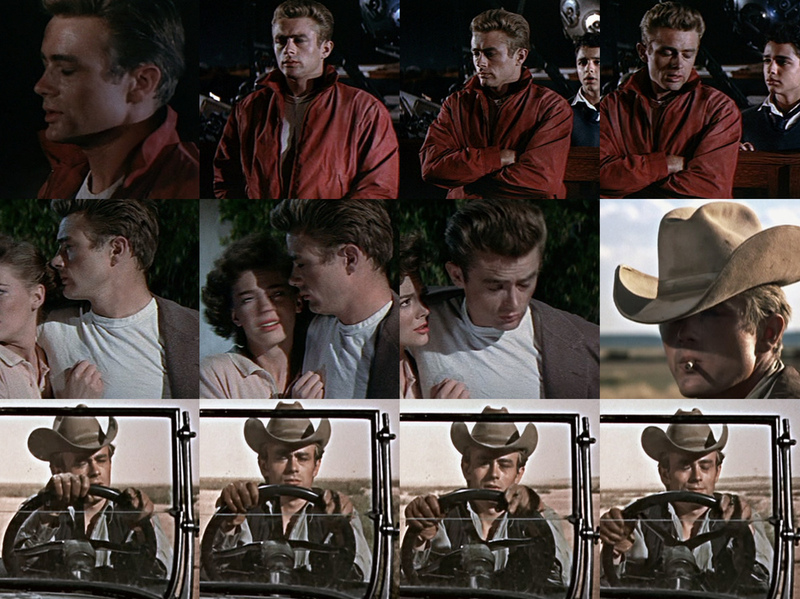 Here we see a tension between human culture and nature that is often present in his work, an un-weighted consideration of man's desire to find control through order. 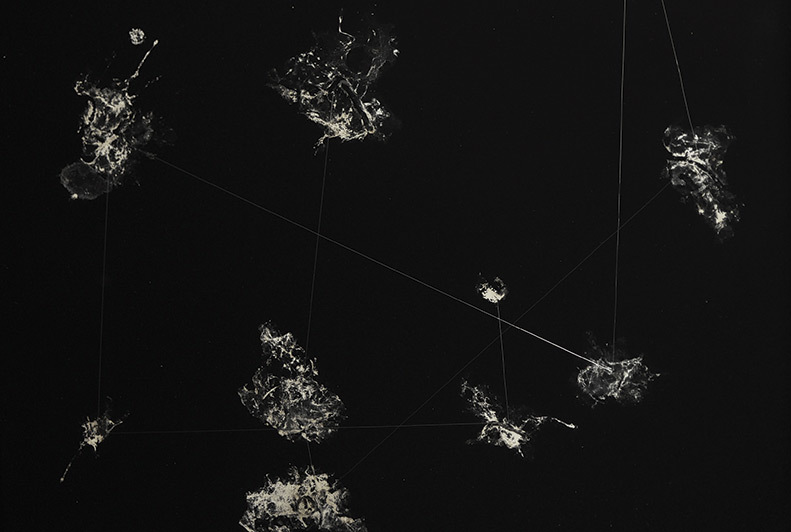 the elements in Complex System 58 and 59 vary slightly in colour and texture in spite of their inherent natural order and further human processing. Despite all attempts there are no exact replicas in either nature or human production; we must accept that true order and control are a fallacy.